Yin Yoga and meditation are refinements of awareness. 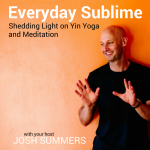 The purpose of this podcast is to illuminate the theory and practice of Yin Yoga, Chinese Medicine, and meditation as three interwoven tools for apprehending the Everyday Sublime. As Stephen Batchelor says, "the mystical does not transcend the world, but saturates it." When your mind is given permission to be receptive to the total spectrum of experience and to relax within that process — and to not try and push unpleasant things away — one of the things that relaxes is the resistance to conflict. I’m sure you’ve heard the old aphorism: “That which you resist, persists?” Well, it’s true in meditation, too. If you resist conflict, it tends to just push back and kick its heels in deeper. But if you are receptive and allowing of it, the conflict tends to shift and move, change and flow; it comes and goes more fluidly. The general “mental posture” within a Yin approach to meditation is for your mind to be receptive and open to the full range of your inner experience. But with such an open-ended approach, it’s not uncommon for challenging emotions and themes to arise within your practice. I suggest handling these strong mental/emotional energies in the same manner that you might negotiate strong sensation in the body during a Yin Yoga posture. In a Yin approach to meditation, the main emphasis is to develop a relaxed and receptive attitude towards the experiences you have while meditating — you’re not trying to control or overly manage those experiences; you’re developing gentleness and tolerance to yourself and the variety of experiences you have while meditating. To this point, my teacher, Jason Siff, sometimes defines meditation as this: “Meditation is what happens when you act upon the intention to meditate.” In other words, whatever happens while you attempt to meditate is the meditation.